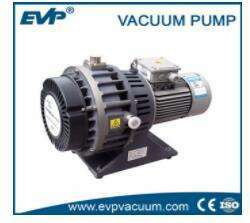 EVP 150—Reliable and durable small oil-free scroll vacuum pump- Vacuum Pump - EVP Vacuum Solution! EVP 150 oil-free scroll vacuum pump provide an effective solution for concerned questions ,such as, pump performance, pump size and environmental issues analytical instruments and medical device industries ,etc. 20 years in the widely used air conditioners, automobiles, refrigerators, machinery manufacturing, and so on to the field proven oil-free scroll vacuum pump with its clean and free of oil, energy saving scroll technology has irreplaceable advantages in vacuum to obtain the field, EVP vacuum pump manufacturer has been gradually durable and reliable user acceptance and trust, and become one of the mainstream products of vacuum equipment free of oil. EVP 150 has superior vacuum performance, size is only 416 × 245 × 277mm, pumping speed of up to 2 liters / sec limit pressure reaches 8Pa, compared with the same specifications of oil-free rotary vane pump low pressure limit three times more than the same size of the diaphragm lower limit pressure pump more than 5 times; temperature lower than rotary vane vacuum pump 25 ℃, while energy consumption is only 50-60% of the same size oil rotary vane vacuum pump. As a compact, high-performance oil-free vacuum pump, EVP150 unique structure, no oil lubrication or water seal, no return of oil and water vapor, basically to avoid the sudden failure of rotary vane pumps and diaphragm pumps such as mechanical and vacuum was killed damage defects, significantly longer service life; and as a molecular pump system foreline vacuum pump, a low background pressure and energy consumption can be reduced bearing temperature, improve the reliability of the vacuum system; oil-free design not only avoids vacuum system oil pollution, but also to avoid the expense of buying oil and oil change, handle and clean, and more importantly, only 50% of energy consumption, significantly reduces the user’s operating costs. Small size, low noise, energy saving and environmental protection features of the device so that it can be easily vacuum equipment manufacturers supporting, for analysis and testing equipment, high-energy physics, semiconductor fabrication and industrial production provides a cheap and reliable oil-free vacuum environment. EVP 150 so reliable and durable oil-free vacuum pump application development to small roughing pump on.